Koizumi Falls (小泉の滝) is one of waterfalls in Shima Onsen. The water of this falls is so pure and beautiful. In Summer, it is surrounded by green leaves, and in Falls, it has great view with Koyo leaves. There is no parking. 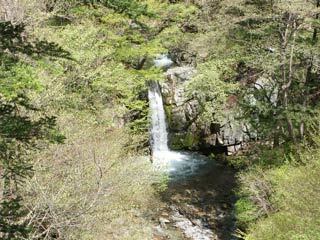 There is an observatory, and it is the easiest falls to see in Shima Onsen.